Today’s protest coincides with the anniversary of Jonathan Corrie’s death near the Dáil four years ago. 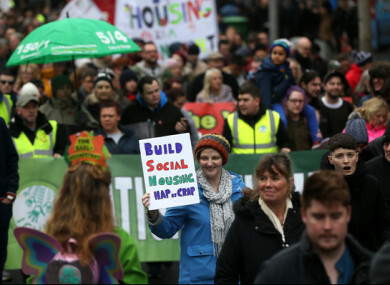 THOUSANDS OF PEOPLE have marched through Dublin City Centre this afternoon to highlight Ireland’s housing crisis. The demonstration – which included union representatives, community groups and political parties – started at the Garden of Remembrance on Parnell Square shortly after 2pm and made its way down the quays before finishing at Dame Street. Traffic disruption was expected during today’s demonstration, which was held to mark the anniversary of Jonathan Corrie‘s death. The body of the 43-year-old was found in a Dublin doorway on 1 December 2014. His death sparked an increase in action from housing activists around the country. “If you remember back to four years ago and within that time, in those four years, homelessness trebled,” National Homeless and Housing Coalition (NHHC) co-chairperson People Before Profit councillor Tina McVeigh told TheJournal.ie ahead of today’s protest. At a rally following today’s march, MacVeigh called for a minute’s silence for Corrie. The NHHC, which is made up of trade unions, politicians and campaign groups, made headlines in October, after holding the Raise the Roof rally in Dublin city centre. There’s been an increase in activists raising awareness over housing issues since the summer, as Ireland’s rental crisis deepens and homelessness continues to increase. The Take Back The City (TBTC) group has held numerous protests in Dublin city centre, alongside a range of occupations of properties in the north inner city. Figures released earlier this week show that there were 9,724 people living in emergency accommodation during the period recorded in October. Commenting on the figures, Minister for Housing Eoghan Murphy said that “there are still too many families and children experiencing this crisis”. Demonstrators have called for a number of measure to be implemented by the government, including a constitutional right to housing, further rent controls and an end to evictions. With reporting by Hayley Halpin. Email “Thousands march through Dublin city centre to protest housing crisis”. Feedback on “Thousands march through Dublin city centre to protest housing crisis”.